Some time ago we reported that Mega Man was blasting his way to Nintendo Badge Arcade in Japan. 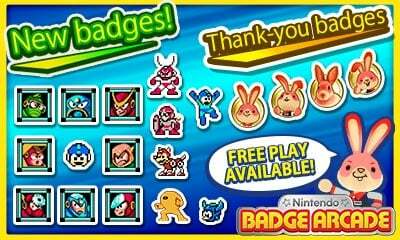 The time has finally come for the rest of us; you can get your Blue Bomber-themed badges now, along with various characters such as Protoman, Rush and all your favourite Mega Man villains. There is also some news of a 'Thank You Campaign' which has started recently. For each $1 spent (and equivalent prices elsewhere) you'll receive thank-you badges of the game's mascot, up to a maximum of $4 and four badges. The campaign ends on the 25th May, so check it out to see if your favourite Arcade Bunny moments are captured as a badge. How are you enjoying Nintendo Badge Arcade? As always let us know with a comment below. Have there been any Sonic or Sega badges in Japan? The badge arcade is a great little time consumer. Elated to see the Mega Man badges arrive. Nabbed me a few from the 2 free plays. In less interesting news, the Animal Crossing island theme is a bonus download if you buy at least 10 plays this week. The actual 3DS theme, mind you, not the music. I've spent far to much money on these badges lol i love the game but never actually stick badges on my home theme . @Moon Same question here! When we will have SEGA badges to put near those beautiful 3D remaster gems??? @Moon Lol!! And I'm using the screw attack symbol from Metroid in my SEGA folder, at least it is a blast processing S!! I'm still spending way too much playing this game, and badges like these isn't gonna help. @Moon Glad I'm not the only one using a blue splat for my SEGA folder! Note: They actually did NOT land in America today, just PAL regions from the look of it. Article's a bit misleading there. We do have the bunny badges, though. These are fantastic, I'm getting all of them! Those Mega Man claw machines are easy.With 3 free tries(2 from the rabbit and one from the machine with the fake badges) I got Dr.Light,Dr.Cossack,Roll,Kalinka,Beat and Rush. I thought I dismantled Mega Man ages ago? I get so confused by this stuff... I sign in every single morning at about 5:20am. I know I'm getting the "new" content because occasionally I'll get the little skits from mr. badge bunny. Today I signed in; an hour ago. I didn't see any mega man badges! I saw a whole slew of new Metroid badges (which I happily spent money to get after my 2 free plays) but no mega man! Maybe tomorrow? I hope so- I've been dying for mega man badges! Haven't opened up this app in like a month. It's got a free play, so I'll give it a go for some Mega Man love. @darklinkinfinite I would also like to see those US NES/SNES badges as I only use them to represent virtual console folders, but damn, $5 a week on these virtual stickers? You're gonna regret that one day... like tomorrow. And why should WE not spend money because YOU don't like him? @Detective_TeeJay Because I said so, lol. I don't want Nintendo to use him again. Should have brought back the Swap Note girl. Might try to get them with free plays, but I pretty much got all the badges I would want so I won't be spending any money or whatever for it at the time being. i've never gotten sucked into any game that starts free and later asks for money before this one, but nintendo has done it! i play most days, and i don't really want to contemplate what i've spent on virtual stickers! so far i've only used a fraction of them (weird zelda stuff and bonsai and birds). finally something better than a blue splatoon gun for my megaman folder. still need something for my pinball folder, but a Mario vs DK minis coin will do for now.